If you're looking for a handy reference for your paper folding projects, consider picking up a copy of World's Best Origami. Written by Nick Robinson, this comprehensive guide to the craft features more than 100 different models for you to create. Robinson has been practicing origami for over 30 years. He is a member of the British Origami society, the author of 35 different books on origami, and regularly teaches origami at schools and art centers. 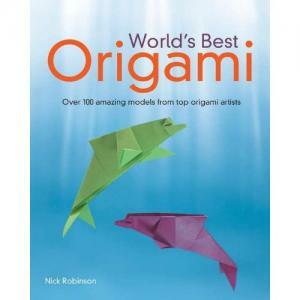 In World's Best Origami, Robinson provides instructions for making origami boxes, containers, birds, animals, flowers, and people. There are also instructions for models that are slightly quirky, such as origami popsicles, candles, kettles, and apples. The models in World's Best Origami are nearly categorized by type, with a numerical rating that indicates the difficulty level for each project. Each section has projects for beginning, intermediate, and advanced origami enthusiasts, so you're sure to find something that fits your needs. There are no photos of the finished projects, but the diagrams are relatively easy to follow. Although World's Best Origami would be worth picking up just for the project ideas, the book also has a handy tutorial section covering the basics of origami. Some of the topics covered in this area include tips for perfect folding, understanding origami symbols, making divisions, and creating bases. Even though much of this general information is available through various online origami websites, it's nice to have everything compiled into one central resource that doesn't require you to have a computer handy when you're working. LTK: How did you become interested in origami? craft section, trying basket weaving, macramé, and many other activities until I discovered origami. It was, for me, a perfect combination of a reproducible process but one where I could put my own stamp on it. 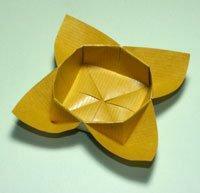 LTK: Do you prefer to make origami that is decorative, such as flowers or animals, or do you prefer to make practical projects such as envelopes and containers? NR: I like the whole kaleidoscope of subjects. For me, the important part is the folding sequence. Is the model elegant and interesting to make, or is it just hard work? LTK: Can you describe your process for creating instructions for an original origami model? Do you combine designs that are previously published or do you start entirely from scratch? NR: How do I create? Some designers choose a subject, then figure out (sometimes using a computer) the best way to fold it. I prefer a more intuitive approach, where I play with the paper until something emerges, like faces in a cloud. I then use my 30 years of experience to guide the model towards completion. It doesn't always work; 1 in 20 may get to the stage where I create diagrams for them. LTK: For the novice paper folder, what are some clues that a project will be easy to complete? NR: Usually, it's just how many steps. If there are under 12 steps, a model ought to be easy. There are some notable exceptions to this rule though! Another benchmark is, "How many narrow points does it have?" Making more than four narrow points such as legs immediately raises the difficulty level. LTK: What is the most common mistake beginners make when trying to complete an origami project? NR: 1) Choice of model. People are tempted to go to the end of a book and try a difficult model, because they think complex is better. Always work thorough the simple projects first. 2) Slow down! Origami isn't a race or competition. The best folders work slowly and neatly. LTK: Do you have any helpful tips to offer parents who want to teach their children about the basics of origami? How old does a child need to be to learn this craft? NR: With younger children, decorating the model after folding is equally important, since it allows them to put their own stamp on it. I'd suggest five years old is about the youngest, but it can vary according to the child. Don't overburden them with technical origami language and don't judge models by their neatness. This will come with practice. Origami should be all about fun. Display their work prominently and praise it! For more information about taking your paper folding skills to the next level, visit World's Best Origami on Facebook or take a look at the designs featured on Nick Robinson's personal website. ~ A review copy of World's Best Origami was provided by the publisher.